Today I want to share with you, no not a recipe nor a food story, but the tale of the Hindu Goddess of Plentiful Food. Yes we do have a Goddess for food, plentiful at that and she is one grand lady, dressed in rich robes with control over the universe's granaries; so we believe. We Bengalis have a saying ''baro maash ee tero parbon''...literal translation means in twelve months we have thirteen festivals...what we mean is that some festivity or the other is always going on in Bengali households. Among the spring festivities Annapurna Pujo stands out for its grandeur. It is held on choitro maash er aasthami/the eight day of the first month of spring, according to the Hindu calender. Annapurna is a Sanskrit word. Anna means rice/food and purna means full...the belief is if you pray to this Goddess your household would never lack of food. She is an avatar of Parvati, Shiva's wife. She is one grand dame sitting on a throne, ladying over the world's food, while her husband Shiva, the Hindu God of destruction and rejuvenation, is a penniless vagabond. So Shiva has to depend on Annapurna's largesse. Her main temple is situated in Kashi, so the belief is that no one goes hungry in that ancient city. My mother always offers a silent prayer to this Goddess before starting to cook. She is not alone, Hindus over the centuries have been doing this. The belief is if you pray to Annapurna you would never be short of food while serving your family. Like all other ancient religions, in Hinduism fire plays a very important role. It is used for purification and as a medium to reach out to the Gods. The above photo is that of a hom which is a sacred fire ritual which goes on for half an hour, while chanting slokas (prayers in Sanskrit) priests keep feeding the fire with ghee/clarified butter. The above photo is that of sondhye aarati/ evening prayer. One hundred and eight lamps are lit for this. The Goddess during the aarti/evening prayer. Bhog--food offered to the Goddess. Since in Bengali households Gods/Goddesses are treated as guests, usually feasts are prepared to serve them, like any other important guest. Of course there is method of cooking these feasts--it is pure vegetarian food, cooked in separate vessels without onion, ginger or garlic. The salt used is also different. It is called sandhuk noon, a purer form of salt. Once the prayers are over, this food is distributed among the guests. 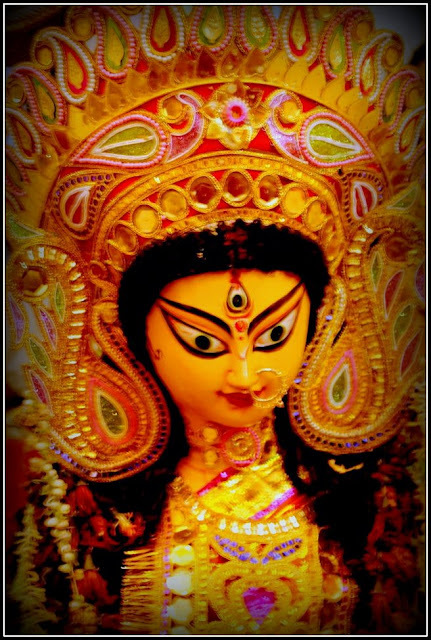 Hope you enjoyed a glimpse of Annapurna pujo. All the photographs belong to my friend Joy whose family in Kolkata celebrates this pujo. P.S. I have shared the Hindu folklore of Shiva and Annapurna from my memories, there are numerous versions out there. It may be possible that your version does not match mine. Elaborate and Yummy to read indeed !! Bhog khawar akta alada charm .. I knew about Shiva but not Annapurna ;D Interesting read as always , Suchi ! lovely post..nice to know about Annapurna devi...:)..keep writing such posts n stories dear..!! Look at that food! Yum. Thanks for the story. Loved every second of it! 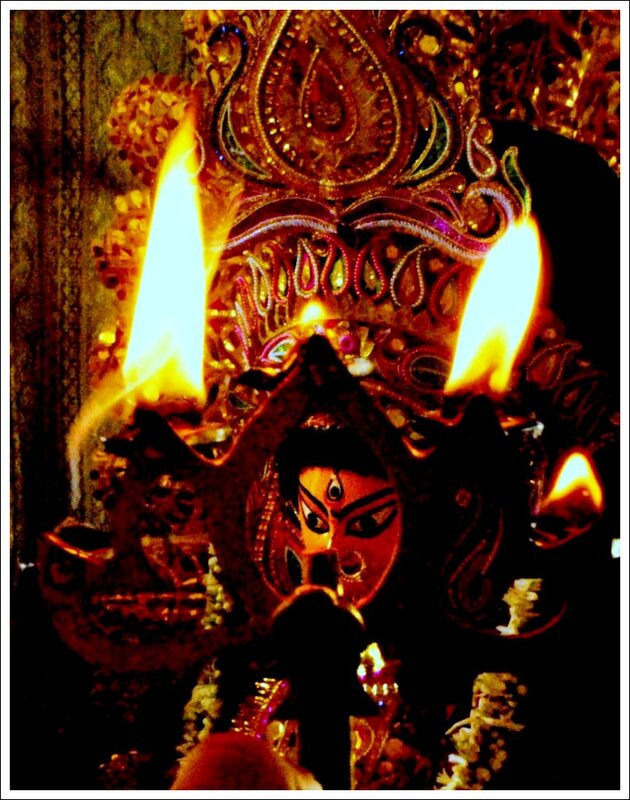 Annapurna puja is similar to durga puja. Bengali celebrate this very well. All photos look awesome..
Hi Suchi, thanks for sharing the informative and interesting story. I love that you've shared this folklore--it's so much fun to learn about other cultures! That is a lovely post! I enjoyed reading it. Always nice to brush up on the various versions of mythology. Not been accessing my comp of late and haven't been reading blogs either. Its wonderful to read your stories again. Whatever the version of the story, the occasion calls for celebration and food!! loved the story! I do remember a similar one too!